Although it’s been in the news, a lot of people don’t fully realize yet just how technology is revolutionizing the contact lens. Brief recap: contacts were originally conceived of in 1508 by the genius Leonardo DaVinci. The first practical lenses were made in 1823 by Sir John Herschel. In 1887, a glass lens was made that covered the eye. In 1939, plastic was first used. Soft contacts first appeared in 1971. Overnight contacts arrived in 1981, and disposable contacts in 1987. In 2002, silicone-hydrogel lens were brought to market. As you can see, it took a long time to get concepts working and to the public. Things have picked up over the last 40 years or so though and now developments are coming fast and furious. Sony, which made its mark with consumer audio and video products and later PCs and gaming, may have lost a competitive step in recent years, but its R&D has always been bold and innovative. So to learn the Japanese giant has moved into contact lens research is not a shock. Along with at least Google and Samsung, Sony has filed a patent for contact lenses that have a camera embedded. Sony’s version would use a blink system to take pictures. The lenses can distinguish between a random blink and an intentional one. People blink nearly 30,000 times a day (15-20 times per minute or around 12,000 per hour if you’re curious about the math) and while it might be entertaining, no one really wants 30,000 pictures a day. The hardware in Sony’s approach is on the periphery of the lens so it can’t interfere with your vision. 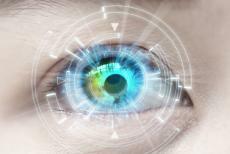 For power it uses piezoelectric sensors, or motion detectors, which convert your eye’s movement into energy. While only a fool or a genius would try to predict how technology will develop or more importantly what will be accepted by the public, it’s clear that this is only the beginning. As computing power grows ever more powerful and miniaturized, and as it continues to move away from PCs and the like, the capacity of lenses like these will only improve.